Since slipping a disc in a kitchen as a teenager, Mum has been prone to having a bad back. But whenever she comes to visit, she insists on lugging the most enormous booty down from Leicestershire with her. She’s been known to arrive at the Barnet Grove bus stop with a box of six (glass) bottles of homemade elderflower cordial and litre jars of jams and chutneys in tow. Here is a photograph of her from a recent visit. Yes – your eyes are not deceiving you – here she is in my living room unpacking a suitcase full of windfalls she brought with her on the East Midlands train. Quite remarkable. I am always dismayed, but also very, very grateful. Bramley apples are flipping expensive in Central London, and it’s a luxury to have a supply out on the balcony. But just this morning, (as I was putting some salmon in the smoker), I saw a bit of brown creeping round an apple in one of the oldest batches of windfalls. They had got wet, and rot had set in. I decided it was time to do something with them, so I peeled, cored and cut up the remainder of the bag and stewed them. People don’t stew apples enough. It gives off such a wonderful sweet aroma. Stewed apple is delicious with yoghurt, great with pork, suitable for a babies and also freezable. So, all round, a pretty exceptional thing. The smell of the stewed apples also reminded me of a wonderful restaurant I went to in Copenhagen, and have been meaning to write about. 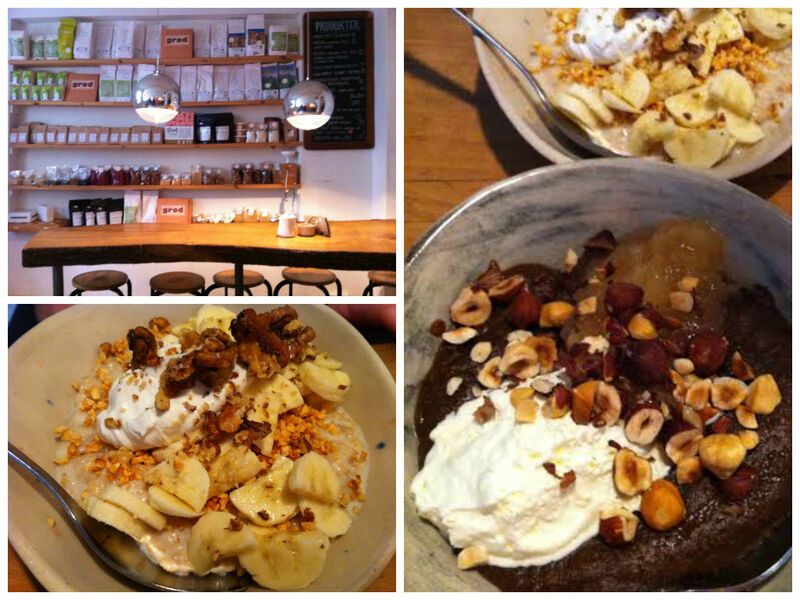 It is called Grød, and it prides itself on being the first porridge-only cafe. Sure enough, it isn’t just a destination for breakfast or brunch. 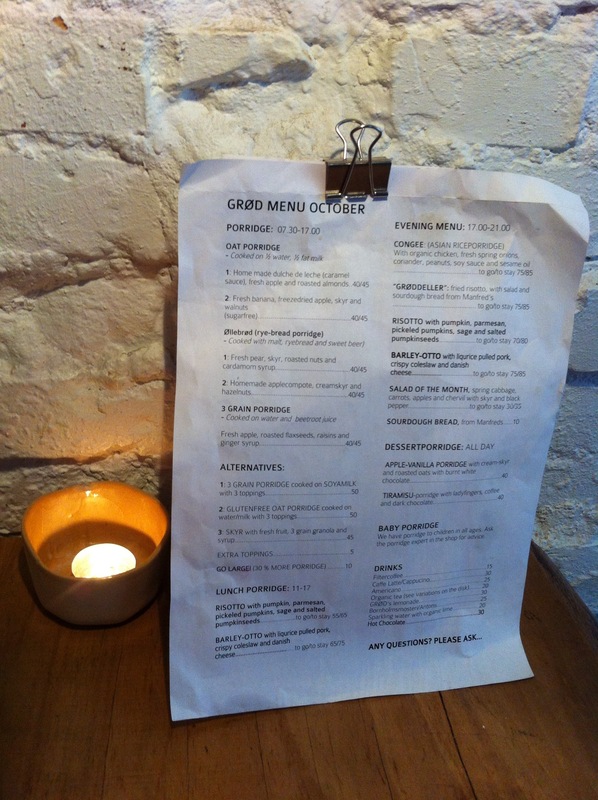 Grød also does inspiring main courses – from a traditional Asian congee (rice porridge), to a barley-otto (barley-based risotto) served with liquorice pulled pork, crispy coleslaw and Danish cheese. In a recent post on Banana Porridge, I sang the praises to good porridge oats. Really, a cheap porridge oat has nothing on a quality porridge oat. No matter how carefully and lovingly you cook a cheap oat, the porridge will never reach its full creamy, rich potential. A good porridge needs the investment of a little extra money, as well as a little extra time. The people at Grød really know their stuff. Fundamentally, the concept of a porridge cafe is really quite simple, but by using amazing ingredients, it was really quite exceptional. They have bags of the grains they used for sale on shelves along the wall of the cafe: cracked oats, course oats, rye flakes, kamut, barley and a Scandanavian grain known as Svedjerug (like rye, but longer). Tom is a Scot who knows what he likes. So he ordered a bowl of Oat Porridge (cooked on a 1:1 ratio of water and milk) with fresh banana, freeze dried apple, cream and walnuts. An exceptional breakfast. I decided to be adventurous, and I went for a bowl of Øllebrød (rye bread porridge) “cooked with malt, rye bread and sweet beer with homemade apple compote, cream skyr and hazelnuts. We were the only people in the cafe, so I wasn’t sure what to expect. But five minutes later, a bowl of dark brown porridge was placed in front of me. The steam coming off it was thick with hoppy smells, and there was a beautiful sheen to the dark rye – which, in my opinion, is a good thing when it comes to porridge. It indicates creaminess rather than wateriness. The flavour was extraordinary. Potent and beery, and bitter-sweet. It was a struggle to finish the whole bowl. Not at all because of any unpleasantness, but just because the flavours were, (particularly in a porridge format), so foreign, and so very, very rich. Øllebrød is one of those medieval dishes which has seen a sudden – and totally unexpected – revival. The dish has monastic roots, from when Danish monks would dip slices of rye bread into hot beer. For a time, Øllebrød was a popular meal, as it is a good way of using up old rye bread. But around the twentieth century, it slipped out of fashion, until a sudden Scandinavian culinary revival dredged it out of obscurity, and put rye porridge back on the map. I have been wanting to give Øllebrød a go for a while now. The fact that I was making stewed apple round a time that I’d bought some seedless rye bread from Sainsbury’s made it just too much of a coincidence not to seize the opportunity. I was really pleased with how similar mine tasted to the Grød version (the texture needed a little extra work, but it did have the same sheen). I stuck to the apple compote and cream toppings which Grød used, and would really recommend that you use the combination as a starting place before experimenting too much. The sweetness of the cream and the sharpness of the apple compote really are quite crucial in the roundedness of this very well conceived, highly nutritious and oddly comforting dish. 1. Tear the rye bread into chunks, and soak it in the ale. I soaked the rye bread for just one hour, but I imagine that overnight in the fridge would be ideal. 2. 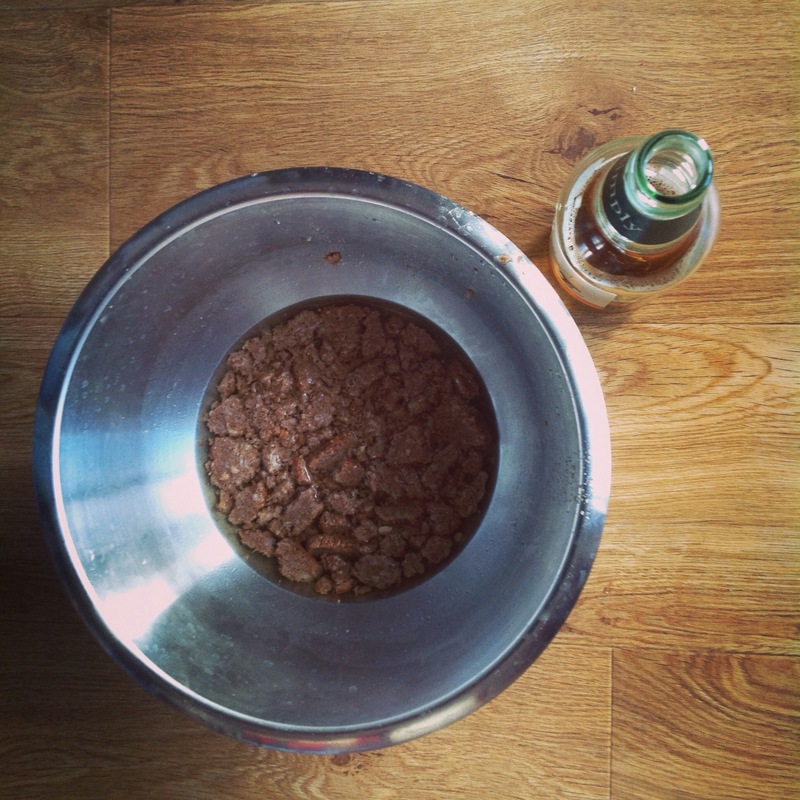 Tip the softened rye bread and ale into a saucepan, and start to heat. Not much will happen for the first five minutes, as the ale comes up to a simmer. But suddenly, the mixture will come together and thicken quite dramatically. 3. If the rye bread was really well-soaked, then a fork might be enough to mash it into a smooth paste. If not, then use a whisk or a blender. 4. 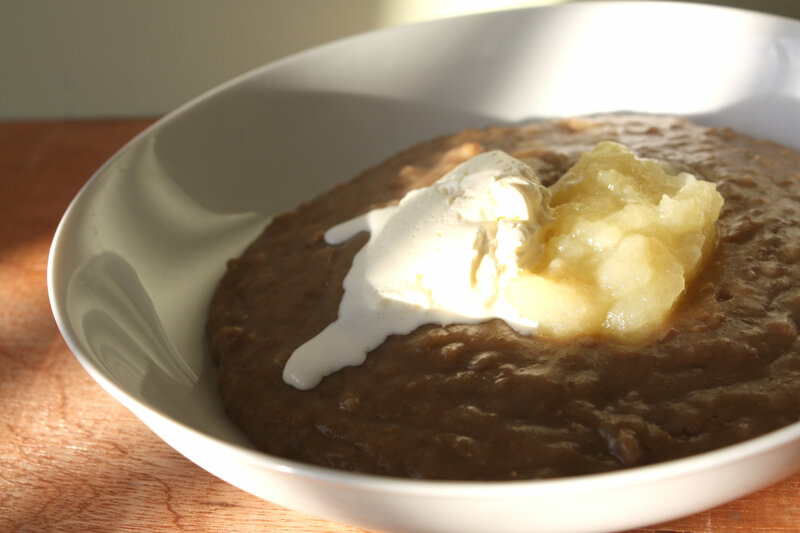 Pour the Øllebrød rye bread porridge into a pre-warmed bowl, and serve with a tablespoon of cream and stewed apple.